Electricity is a major constituent for the economic growth of the country. There has been a surge in demand for power in India which was due to increase in capacity utilization, industrialization, urbanization and population. Currently, India has the fifth largest installed capacity in the power sector worldwide. Reforms such as “Power for all” and plans to add 88.5 GW of capacity by 2017 and 93 GW by 2022 would fuel the demand for power transmission and distribution equipment. According to 6Wresearch, the India power & distribution transformer market size is forecast to reach $2.9 billion by 2022. Government is taking major steps to strengthen the power transmission & distribution network and has undertaken initiatives such as UDAY for financial turnaround of power distribution companies. Further, the Government of India has projected an investment of INR 146,000 crore in power transmission sector by FY 2019 to strengthen the transmission network thus increasing the demand for power transformers. The Western region accounted for the largest India power & distribution transformer market share in 2016. However, the major investment in transmission sector is expected in the Southern region, followed by the Northern and Western region. In the distribution sector, the Western region is expected to receive highest investments followed by the Southern and Northern region. The India power & distribution transformer market report thoroughly covers the market by transformer types, by power rating, by cooling system, by applications and by regions. The India power & distribution transformer market outlook report provides an unbiased and detailed analysis of the India power & distribution transformer market trends, opportunities/ high growth areas, market drivers, which would help stakeholders to device and align market strategies according to the current and future market dynamics. • Historical data of Global Power & Distribution Transformer Market Revenues for the Period 2012-2016. • Market Size & Forecast of Global Power & Distribution Transformer Market Revenues until 2022. • Historical data of India Power & Distribution Transformer Market Revenues & Volume for the Period 2012-2016. Forecast of Revenues & Volume, until 2022. • Historical data of India Distribution Transformer Market Revenues & Volume for the Period 2012-2016. • Market Size & Forecast of India Distribution Transformer Market Revenues & Volume until 2022. • Historical data of India Power Transformer Market Revenues & Volume for the Period 2012-2016. 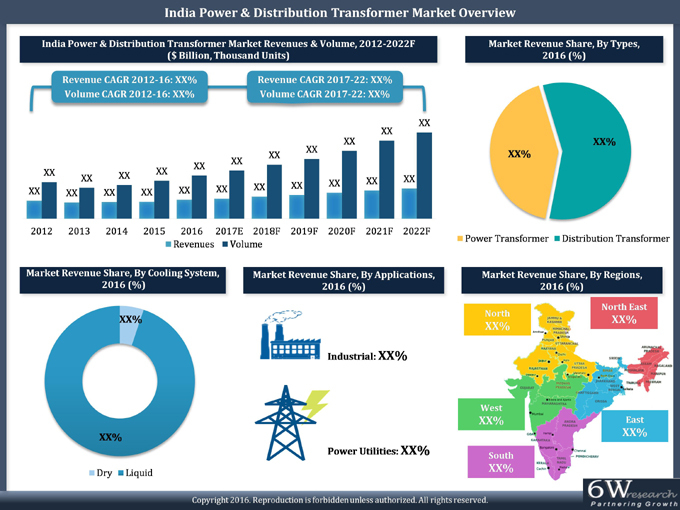 • Market Size & Forecast of India Power Transformer Market Revenues & Volume until 2022. • Historical data of India Dry Type Power & Distribution Transformer Market Revenues for the Period 2012-2016. • Market Size & Forecast of India Dry Type Power & Distribution Transformer Market Revenues until 2022. • Historical data of India Liquid Type Power & Distribution Transformer Market Revenues for the Period 2012-2016. • Market Size & Forecast of India Liquid Type Power & Distribution Transformer Market Revenues until 2022. • Historical data of India Power & Distribution Transformer Market Revenues, by Applications for the Period 2012-2016. • Market Size & Forecast of India Power & Distribution Transformer Market, by Applications, until 2022. • Historical data of India Power & Distribution Transformer Market, by Regions for the Period 2012-2016. • Market Size & Forecast of India Power & Distribution Transformer Regional Market Revenues until 2022. • India Power & Distribution Transformer Market Trends and Developments. • India Power & Distribution Transformer Market Overview on Competitive Landscape. 17.3. Bharat Heavy Electricals Ltd.
17.6. GE T&D India Ltd.
17.8. Kirloskar Electric Company Ltd.
17.11. TBEA Energy (India) Pvt. Ltd.
17.13. Transformer & Rectifiers (India) Ltd.